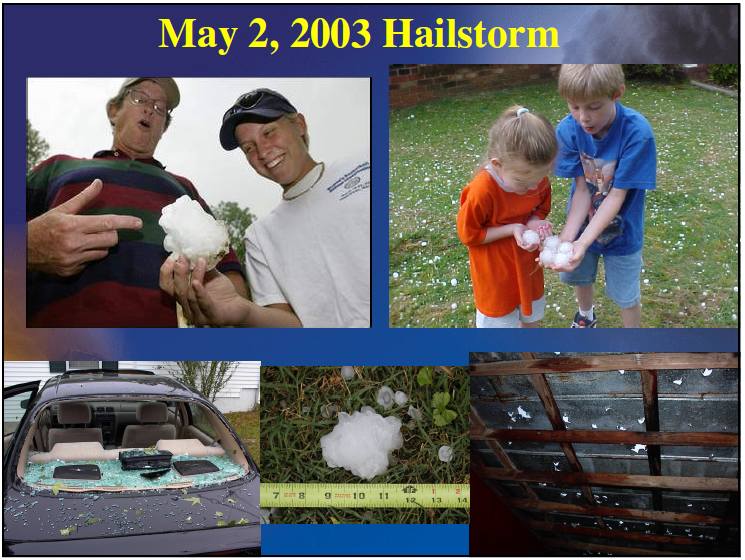 On this date in 2003 some of the largest hail ever recorded in Alabama fell, with numerous reports of hail as large as baseballs and softballs. Below is a list from the NOAA Storm Data publication for 2003. Significant damage to roofs and automobiles was reported. Boundary interactions led to storm initiation in a high CAPE (very unstable) environment. Despite many rotation signatures on radar, no tornadoes were confirmed in this event. CAPE values were as high as 3500-4000 j/k. Etowah: 1:53-2:44 p.m. Baseball 2.75"
"Penny to baseball size hail fell along the eastern Etowah County line. The hail fell from near Keener to near Ball Play. A few trees were also blown down near Ball Play. The hail may have been larger in rural areas because of larger reports in adjacent counties." Cherokee County: 2:29-3:22 p.m. Softball 4.5"
"Hail up to the size of softballs fell across western and southern Cherokee County. Many locations reported the hail was covering the ground. Most of the hail fell across rural areas." Calhoun County: 2:54-3:25 p.m. Golf ball to Softball 4.5"
"Very large hail fell across extreme northern Calhoun County. 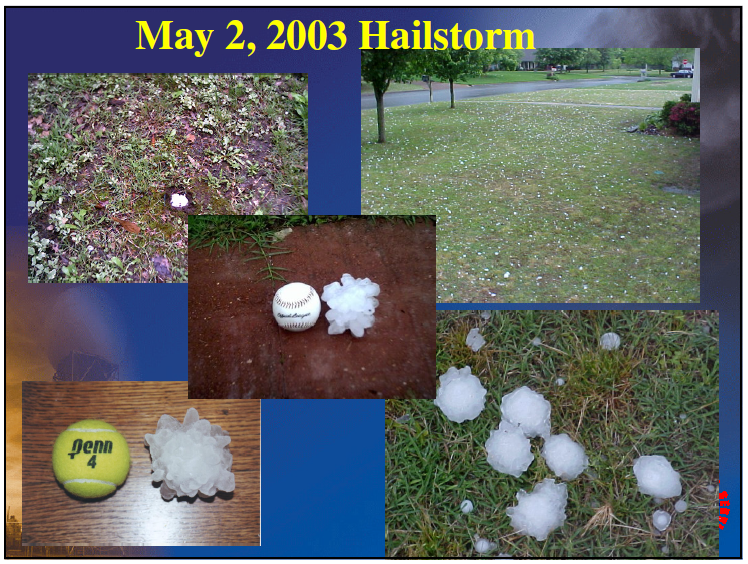 A majority of the hail was golf ball size and covered the ground in a few locations. A few reports were received that a couple of the pieces of hail were softball size. Most of the hail was thrown out of a storm located farther north in Cherokee County and little rain was observed with this storm." Marengo 3:35-3:54 p.m. Tennis ball 2"
"Hail up to 2 inches in diameter was reported in extreme northeast Marengo County near Faunsdale." Hale County 3:45-4:26 p.m. Baseball 2.75"
"A large swath of hail moved through the heart of Hale County. Hail up to the size of baseballs was reported along the path. Several automobiles received windshield damage from the large hail. Several trees and power lines were also blown down during this storm near Greensboro. This was the third large hail producing storm to affect Hale County during the afternoon hours." Jefferson County 4:47-6:04 p.m. Baseball 2.75"
"A supercell thunderstorm moved across western Jefferson County and produced a large swath of hail. The largest hail reported was baseball size but the hail may have been larger in surrounding rural areas. Large hail was reported in Sayre, West Jefferson, Hoover, Hueytown, Bessemer, Birmingham and Palmerdale. A few locations observed hail covering the ground. Numerous reports of funnel clouds were also received." Shelby County 5:40-7:00 p.m. Softball 4.5"
"Several severe thunderstorms moved through Shelby County and generally affected the western part of the county. All of the storms produced dime to golf ball size hail. The largest hail size reported was softball and occurred near Maylene. 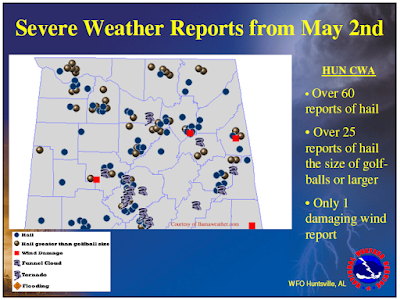 Some locations that reported hail were Alabaster, Hoover, Helena, Maylene, Indian Springs, Calera and Montevallo. Several locations observed hail covering the ground. A few trees were also blown down." "National Weather Service Meteorologist Brian Peters said reports of hail measuring four inches in diameter, among the largest ever reported in Shelby County, came from Maylene. Additional reports of hail ranging in size from one to three inches in diameter was reported from Helena, Pelham and Alabaster. We had a lot of reports of golf-ball-size hail and judging from the reports of car damage there’s no reason not to believe that, Peters said. We also had a number of baseball-size hail reports. Hail is formed when a cold atmosphere prevents larger droplets of rain from falling out of thunderstorm clouds allowing them to freeze, Peters said." * AT 624 PM CDT...NATIONAL WEATHER SERVICE DOPPLER RADAR INDICATED A TORNADO 13 MILES NORTHWEST OF HELENA...MOVING SOUTHEAST AT 25 MPH. EXPECTED WITH EITHER OF THESE STORMS. THIS IS A DANGEROUS STORM. IF YOU ARE IN ITS PATH...SEEK SHELTER NOW. STAY AWAY FROM WINDOWS. Numerous other areas of the state received hail that met severe criteria (which was 3/4" at that time). Those areas are too numerous to mention here. There were also several severe wind reports.